Viking offers a variety of youth after school programs including: Multi-Sports, Soccer, Basketball, T-Ball, Zumba, Fit Kids, Floor Hockey, Dodgeball, Baseball and Flag Football. We provide a safe and fun environment for children to develop healthy social skills and keep their bodies active. 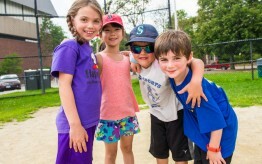 Check out our programs list to find the best fit for your child! Filter sports programs below by sport, day, and time of day. Tartts Day Care Centers, Inc.